Skirt steak is one of the most flavorful cuts of beef, and even though it's one of the tougher cuts, with a lot of connective tissue, it's still a great steak for grilling. Skirt steak actually comes from either of two separate muscles inside the chest and abdominal cavity, below the ribs, in the section known as the beef plate primal cut. The two muscles are the diaphragm muscle, or outside skirt, and the transversus abdominis muscle, or inside skirt. Outside skirt is attached to the chest wall, running diagonally from the 6th to the 12th rib. It's covered with a thick membrane which is the diaphragm itself (the steak is the muscle that moves the diaphragm). Outside skirt is plainly visible on the beef carcass as a long, diagonal flap attached to the chest wall, It's called "outside" because it is affixed to the outside of the body wall. Inside skirt is situated below and a little bit further back from the outside skirt. But unlike the outside skirt, inside skirt is located within the body wall itself, which is why it's called "inside." The inside skirt muscle lies flat across the lower part of the ribs and extending even beyond the ribs, into the beef flank primal cut, which is part of the hindquarter of the animal. As a result, a wide flap of meat at the rear of the transversus abdominis muscle is usually excluded and ends up part of the flank instead. Incidentally, skirt steak is NOT flank steak. For some reason, the two are referred to interchangeably sometimes, but they are not the same thing. Inside and outside skirt are pretty similar: both are long, flat muscles with very thick grain that runs across the length of the muscle. Outside skirt is a bit thicker than the inside skirt and it's more uniform in shape. Inside skirt is thinner, with a slightly more irregular shape (see the photo above). But they're both long, flat and narrow pieces of meat, about 20 to 24 inches long, and maybe three to four inches across once they've been trimmed. A whole inside skirt might weigh two pounds, and maybe a bit less for an outside skirt. But inside skirt will shrink a bit more when you cook it as the muscle fibers tighten up. Because of its thickness and regular shape, the outside skirt is what restaurants and other foodservice operations prefer to use for making fajitas and other grilled skirt steak dishes. And because there are only two skirt steaks per side of beef, one inside and one outside, pretty much every outside skirt from every side of beef ends up in a commercial kitchen of some kind. 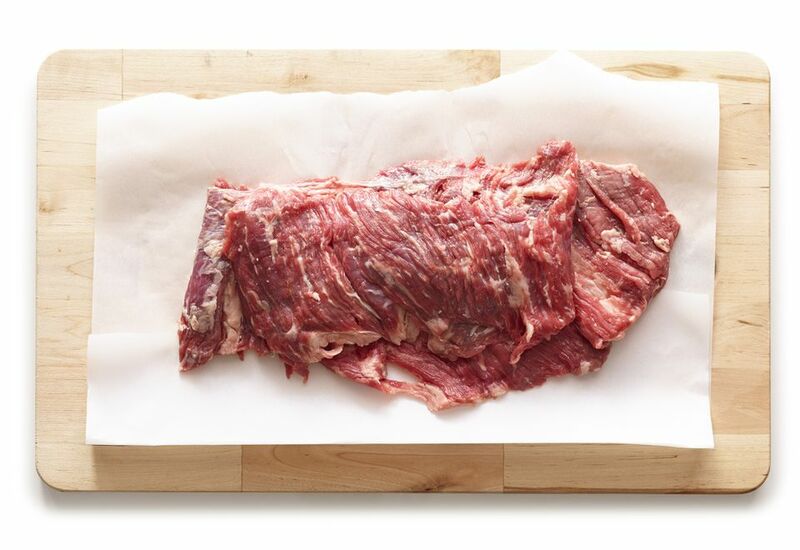 So when you see skirt steak at the butcher shop, it'll almost always be an inside skirt. Outside skirt is encased in a membrane which needs to be removed before preparing it. If the meat has been dry-aged, that membrane will be like paper and will peel off pretty easily. With wet-aged meat, the membrane will be wet, and it's a little bit trickier to peel it off without tearing the meat. Though you're most likely to find inside skirt, a good butcher will have peeled and trimmed it in any case. Both outside and inside skirt have a good amount of fat within and between the muscle strands, which helps keep it moist when grilling it. The grain on the inside skirt is a little bit wider, so it might have slightly more fat. In either case, most of the surface fat (as opposed to the intramuscular fat) is going to be removed by the butcher. A lot of skirt steak recipes call for marinating the meat before grilling it, and because of its looser structure, skirt steak will absorb the flavors of the marinade quite well. But there's no need to marinate it for more than 30 minutes or so, as marinating does not tenderize meat. Skirt steak is tough, however, so the best way to cook it is very quickly over the hottest grill you can get. As a matter of fact, some people will even skip the grill altogether and cook it directly on the coals. This actually works quite well, because you do not want to overcook skirt steak. Cooking it directly on the coals gets the surface of the meat nice and brown very quickly, without cooking the inside of the meat for too long. You can do this in a cast-iron skillet too, or under the broiler, or anything else you can get extremely hot. Just remember, very hot and very fast. Under no circumstances should skirt steak be cooked past medium rare. It'll be way too tough. Finally, and perhaps most importantly, skirt steak absolutely must be sliced thinly against the grain. Because it's so long, your best bet is to cut it into shorter sections first and then slice those sections across the grain. If you're making fajitas, however (and skirt steak is amazing for fajitas), or any other stir-fry dish, you should slice it up first (against the grain!) and then marinate and cook it. Chuck Eye Steaks: Delmonico or Not? What Does the Word "Filet" Mean?